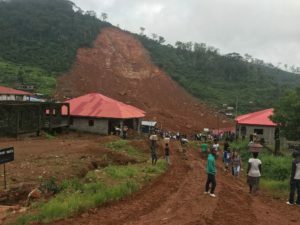 Heavy rains in Freetown — Sierra Leone’s capitol — caused large mudslides that destroyed homes and communities. Over 1,000 are estimated to be dead as a result of this natural disaster with thousands more affected. 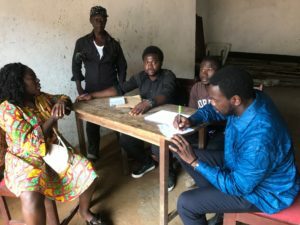 Our Project 1808, Inc. team visited Matormeh Community that was heavily devastated by the recent mudslide and flooding in Freetown, Sierra Leone. We learnt urgent needs include food, clothing and shelter. Any help they said is greatly welcomed. Project 1808 plans to work with the Matomeh Disaster Management Committee to donate what help our friends are able to offer. We are now accepting donations for purchase of needed supplies. Please note your donation is for Flood/Mudslide Disaster victims. In addition to supporting community organizations focused on the recover, Project 1808 will continue to raise funds and collect supplies to ready students for the upcoming school year. As a result of the disaster, we expect many more students to be in need of scholarship, books, and supplies for this fall.